This primer for newbies will teach you how to navigate the world of weed. OK, I admit it: I’ve always been a bit of a dunce when it comes to cannabis. I’m 31 and have only smoked a joint a handful of times with friends (and once on a first date when we got so high that I burst into hysterical laughter because there were too many pho options on the menu). Until I spoke with Up Cannabis’s horticulture manager, Katie Iarocci, who manages the growing, harvesting and processing of Up’s plants, words like sativa, indica, cannabinoid and terpene were gibberish to me. Katie was kind enough to answer all my questions, changing everything I thought I knew about cannabis. (As we already discussed, I didn’t know much.) If you’re in the same boat as me—a cannabis newbie and sort of curious—get ready to learn a whole new language. Fact #1: Cannabis has a lot of slang names. Cannabis, marijuana, weed, pot, kush—they’re all basically the same thing. The big difference? Cannabis is the technical name of the plant, whereas all other terms are slang. Points to you if you already knew this factoid before reading this article… because I didn’t before writing it. Fact #2: There are many types of cannabis and each one creates a different experience. I always thought pot was pot—that it all looks and smells similar and basically has the same effect on the brain and body. But that couldn’t be farther from the truth. The two most common types of cannabis are sativas and indicas (which then have infinite strains within those categories, as well as hybrid versions). Sativas and sativa-dominant hybrids are preferred for daytime use because they “promote more of an energetic, creative high,” says Katie, whereas indicas, or indica-dominant hybrids, are better for relaxation and nighttime use. Find out how cannabis can be used as a remedy for stress. Fact #3: Just because you hated one strain of cannabis, doesn’t mean you’ll hate another. If you tried cannabis once and didn’t like it, you might want to give it another go. Aside from the fact that you might prefer a sativa over an indica and vice versa, each strain will also have its own unique levels of cannabinoids—over 100 chemical compounds that make up the cannabis plant. The two best-known cannabinoids are cannabidiol (CBD), which combats pain, inflammation and anxiety, and tetrahydrocannabinol (THC), which is psychoactive (meaning it will get you high) and acts as a muscle relaxant and antiemetic (i.e. it prevents nausea and vomiting). The levels of CBD and THC in the strain you choose will affect your experience. Still totally confused about where to start? Thanks to legalization in Canada, it will be much easier to learn about the strains that a brand offers, though it will still likely involve some trial and error to find the strains that work best for you. Up has five cannabis strains to start: Eldorado (a sativa with high THC and low CBD for an energizing, creative high), Gems (a sativa-dominant hybrid with a stimulating head high and a bit of a relaxed body feeling), Grace (an indica that will put you to sleep), 50 MC (an indica-dominant hybrid that offers mild sedation and is better for nighttime use) and Morning Moon, pictured above (an indica-dominant hybrid that’s high in CBD and is perfect for a novice user). Fact #4: Each strain has a unique scent and flavour. Remember how I told you I thought all weed smelled the same? Katie felt the same way when she was younger, but now she can tell a strain just by its scent. That’s because each one has a special blend of terpenes, which are “organic compounds produced by a wide variety of plants that are used in perfumery, aromatherapy and even food flavouring,” says Katie. “When you smell lavender essential oil, for example, those are terpenes that you’re inhaling and you’re receiving those molecules into your olfactory nerves and sending messages to your brain.” Those terpenes have the ability to promote wellness, the same way that breathing in lavender essential oil promotes a calm feeling. 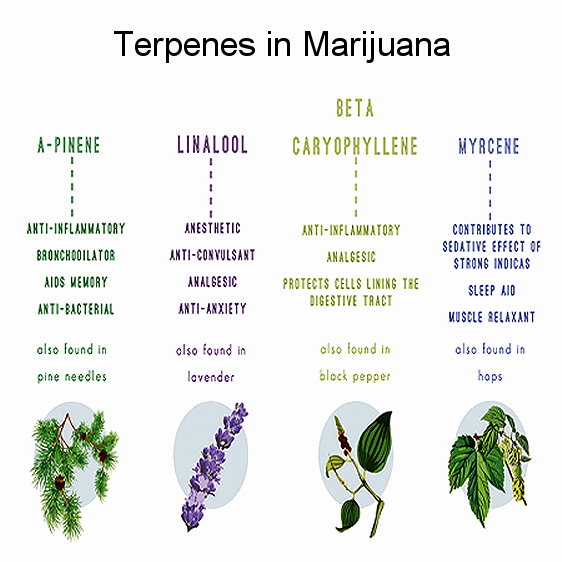 Here’s some more information on how terpenes can boost your health. Fact #5: There’s this thing called “The Entourage Effect” and it matters for consumption. For the same reason that vitamin capsules often won’t be as effective as simply eating a wide variety of foods filled with nutrients, consuming isolated cannabinoids such as CBD won’t have the same effect as if you were to “consume cannabis with the entire profile of cannabinoids intact,” says Katie. “That’s called the entourage effect and it’s a theory that’s gaining a lot of traction as research continues.” It doesn’t mean that taking isolated CBD capsules or using CBD oil has no effect. It simply means that using the entire bud—whether you smoke it, vape it or eat it in an edible—will potentially have more impact on your overall wellbeing. Hopefully, with legalization in Canada, more research can be conducted into this theory. Fact #6: The illicit cannabis market was dominated by men, but that’s changing. Guess what? Cannabis isn’t just for men, even though men have historically dominated the space, choosing and using strains for their own benefit. But as Canadian cannabis brands like Up begin to enter the marketplace, they’ve started to target women with advertising and education. Of course, selling to women helps the bottom line of any company, but it’s also important that cannabis be available to women if they choose to partake. “We could really use female consumers’ feedback,” says Katie. “Historically cannabis works for men, but maybe there are other strains that are better for women.” Plus, cannabis shows promise for helping alleviate menstrual symptoms—something that men know nothing about. Think you’re ready to try some cannabis again or for the first time? Dosing is key. Up goes by the motto that “one puff is enuff,” because until you understand how a strain affects you, you should start with just a small dose and slowly increase. “It’s a huge misconception that you take a puff and can be transported into outer space,” says Katie. Becoming “greened out” or incredibly high (see my above first date experience) only happens if you smoke or ingest too much weed at once. So take a puff and see how it goes. You might love it, you might want to try a different strain or it might not be your thing. Whatever you decide, have fun and be responsible, too. Categories: cannabis | Tags: cannabis, CBD, marijuana, pot, weed | Permalink. (CNN) Recreational marijuana use will soon be legal in Canada after the Senate passed a “historic” bill on Tuesday with a vote of 52-29. Canada is only the second country in the world – and the first G7 nation – to implement legislation to permit a nationwide marijuana market. In the neighboring US, nine states and the District of Columbia now allow for recreational marijuana use, and 30 allow for medical use. Consumers are expected to purchase marijuana from retailers regulated by provinces, territories or — when neither of those options are available – federally licensed producers. Marijuana will also not be sold in the same location as alcohol or tobacco. Categories: marijuana, recreational drugs, Uncategorized | Tags: marijuana, pot, recreational drugs | Permalink. A look at how the provinces and territories plan to manage weed consumption once it’s legalized in Canada. Cannabis curious? Jonesing for your first legal joint? Either way, get ready to roll: Prime Minister Justin Trudeau says marijuana will be legal by next summer. Bill C-45, which will legalize cannabis across the country, largely leaves it up to the provinces and territories to determine how marijuana can be sold and used. Below, we take a look at the current state of these pot policies. Ontario is the only province that has passed its marijuana law. Other provinces and territories are in various stages of completing theirs, so much of the below information is subject to change. Saskatchewan and Nunavut have been excluded from our reefer roundup as both have yet to unveil even partial pot plans. In every province and territory, the federally-mandated public possession limit of 30 grams of dried cannabis has been maintained, though some provinces, like Quebec and Alberta, will permit you to keep more at home. Bill C-45 allows individuals to grow up to four marijuana plants, though some provinces, like Manitoba and Quebec, plan to ban home cultivation. Other notes: More details are expected in early 2018. Other notes: Legal age is one year above the legal drinking age. Municipalities will be able to hold referendums to ban retail stores. Other notes: 20 cannabis stores will be open in July. No possession limits in private residences. All cannabis must be securely locked up at home. Other notes: Cannabis will be sold alongside alcohol in provincial liquor stores. According to a recent Health Canada survey, there is also currently no consensus on how long it takes to be able to drive safely after consuming cannabis. Experts say roadside urine and blood tests are not useful ways to test drivers for impairment because regular marijuana users can yield positive results days — or even weeks — after use. The RCMP, in conjunction with other Canadian police departments and Public Safety Canada, has recently experimented with roadside saliva tests. While these have proven to successfully test for the presence of marijuana in a driver’s system within several hours of use, they cannot quantify a driver’s level of impairment the way roadside alcohol tests do. It is thus feasible for a driver to fail a roadside saliva test despite not being impaired. A recent University of Calgary study, moreover, shows that it’s also possible to fail a roadside saliva test after inhaling second-hand marijuana smoke. Once cannabis becomes legal, police forces across the country will likely be utilizing roadside saliva tests before moving onto assessments by DREs to determine if a driver is impaired. Business groups are hoping that provincial legislation clarifies both employer and employee rights regarding marijuana. It remains unclear if landlords will be able to prohibit tenants from smoking marijuana in rental properties. Saskatchewan, Yukon and the Northwest Territories have proposed laws that would allow landlords to ban using marijuana on their properties. Only time will tell if courts will offer landlords those same rights in other jurisdictions. While dried cannabis and cannabis oil – both of which will be sold in 2018 – can be used to make edible products at home, the federal government has said that packaged edible products won’t be commercially available until approximately one year after legalization goes into effect. Categories: marijuana | Tags: cannabis, marijuana, medical marijuana, pot | Permalink. The WHO’s Expert Committee on Drug Dependence focused on cannabidiol, or CBD, one of the naturally occurring cannabinoids found in cannabis plants. Marijuana advocates applauded the WHO’s conclusion. “It was terrific to see WHO acknowledge what other scientific research has already stated,” says Justin Strekal, political director of the National Organization for the Reform of Marijuana Laws (NORML). “We need to maintain a strict scientific perspective and protocols when it comes to new drugs,” he says. “We need double-blind studies related to marijuana and all components, research on the harms versus the benefits, identification of the side effects and specific ailments identified through these studies – even for CBD,” he says. The experts also say that CBD might be able to treat epilepsy (where most research has focused), although results are mixed. Other conditions it might treat are Alzheimer’s disease, Parkinson’s, anxiety, depression, and other maladies. CBD may ease inflammation, provide antioxidants, and relieve pain. CBD usually is given as a capsule or dissolved in liquid to be taken orally, under the tongue, or as a nasal spray. CBD does not produce the high that another cannabinoid – tetrahydrocannabinol (THC) -does, experts say. In fact, CBD appears to have effects opposite of THC. The WHO announcement drew a positive response from marijuana advocates and criticism from those who don’t want it to be legal. World Health Organization: Cannabidiol (CBD) Pre-Review Report, Expert Committee on Drug Dependence Thirty-ninth Meeting, Geneva, Switzerland, Nov. 6-10, 2017. Scott Chipman, Southern California chairman, Citizens Against Legalizing Marijuana (CALM). Justin Strekal, political director, National Organization for the Reform of Marijuana Laws (NORML). Categories: marijuana | Tags: cannabis, CBD, marijuana, pot | Permalink. Within the first two months of legal marijuana sales in Colorado, property crimes decreased by 14%, and homicide rates were down by 67%. Video games train the human brain to make faster real life decisions. A study found that anxiety disengages the prefrontal cortex, a region of the brain that plays an important role in flexible decision making. Without your little finger, you would lose 50% of your hand strength. Categories: brain, marijuana | Tags: anxiety, brain, marijuana, pot, strength, video games | Permalink.